The Potocki Palace is a Rococo residence, the main tourist attraction in a county town called Radzyn Podlaski in Eastern Poland. The 15th-century fortress was re-designed as a Baroque residence, which received its present Rococo shape in the mid-18th century on the model of Louis XIV’s Versailles, surrounded by a large park with artificial lakes. 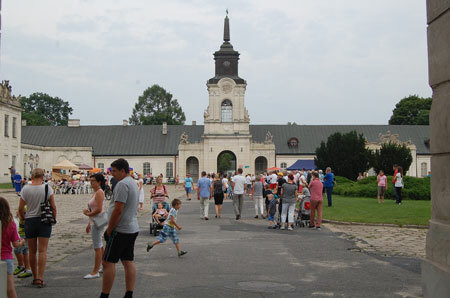 In addition to the architectural and artistic values, the complex played an important role in the historical events of the following centuries as a social and intellectual center of the region, until it was burnt down by the withdrawing German forces in 1944. The appearance of the palace was restored in the following decades. It became the town’s property in 2015, and the façade has been renovated since then. Finding a feasible and sustainable management plan which would allow the revitalization of the interiors and the park is still a challenge. One key question to solve is to find an appropriate financing and maintenance model. This project has received funding from the European Union’s Horizon 2020 research and innovation programme under grant agreement No 776766. The sole responsibility for the content of this publication lies with the authors. It does not necessarily represent the opinion of the European Union.